I finally finished Snow Crash. I took too long to read it, with too many distractions taking away from a book that is meant to be devoured in a short time span, which made the read less enjoyable than it might have been otherwise. The book centers around Hiro Protagonist, a talented hacker and equally capable samurai swordsman, and Y. T., or Yours Truly, a small, blonde, 15-year-old Kourier, who 'surfs' through the streets on her high-tech 'plank' by attaching herself to unwilling cars to pull her along through traffic allowing her to successfully deliver all her packages. In this dystopian future, what we know as the United States has been divided up into corporate-run sovereign neighborhoods, some run by the Mafia, some by Mr. Lee's Greater Hong Kong, some by the United States of America, or the Feds for short, where hackers work 12 hours a day on some tiny piece of a giant puzzle about which they know nothing. These hackers are subjected to constant polygraph testing, on the fear that they will leak some of what they are working on, and the pieces might be put together by an outsider. The novel plays on the male/female, rational/chaos, good/evil, autonomous/automaton dichotomies, which I always take issue with, since the comparisons are always addledly saturated with old gender stereotypes. The female representing the irrational, chaos and disorder and the male order and rationality. Here, Asherah, an ancient Sumerian goddess, is considered to be responsible for some kind of virus that infects the minds at their most basic linguistic level, disallowing creative, autonomous thought, and rendering those infected obedient to the will of the mastermind who unleashed the virus. The characters in the novel theorize that the dueteronomists created or modified the bible to be a vaccination to combat the irrationality of the sect of the religion infected by the 'virus' of Asherah (female goddess) worship. 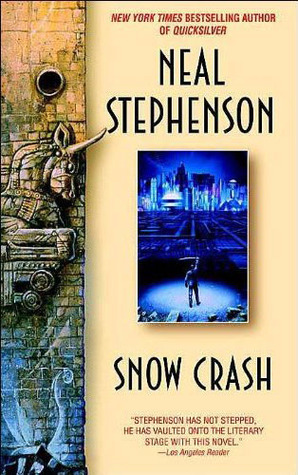 Snow Crash also tackles linguistic theory along with ancient Sumerian mythology, posing the theory that the ancient Sumerian language might sound a lot like glossololia (speaking in tongues), or the language before the Tower of Babel fell. Apparently, no spoken language shares any traits with Sumerian, and many do not share traits with each other. It's all very complicated and utterly fascinating - I'm not doing it any kind of justice here. All in all, the novel is a bit like the next fall of Babel, which is equated as a good thing. I was a bit disappointed with the end, perhaps because there was absolutely no denouement or conclusion, only climax, but that might be personal taste. I'm not really sure, on second thought, that any wrapping up was really necessary. All in all, it was a great read, and I'd recommend it to anyone interested in science fiction, mythology, religion, computers, and fun.